In a weekend which saw the demise of the Spalding Flower Parade, at least in its current form, it was somewhat bittersweet to be present at the launch of a new initiative for the region. Transported is the ‘Creative People and Places’ programme for the residents of Boston and South Holland, designed to encourage participation in arts activities. Backed by a £2.6m Arts Council funding, the vision, over the next few years, is to ‘inspire creative journeys’. In the short term 24 specially commissioned artists will bring art to local communities and the iconic ‘arts van’ – a converted ice cream van- will bring creative treats to towns, villages, youth clubs or factory canteens. The launch in Holbeach last Sunday provided a glimpse of what is to come, the highlight of the day being the luminarium ‘Miracoco’ by Architects of Air. A huge, inflatable sculpture was erected in our local park. Crowds flocked to go inside and be immersed in a sensory feast of colour, light, sound and touch: a surreal experience but unexpectedly relaxing. Throughout the afternoon the residents of Holbeach were treated to a variety of experiences, all free of charge. Conedancers from The Dream Engine delighted visitors with an aerial display on an 8 metre high air-filled cone, stories and puppet shows were held in the arts van, ‘yarn bomber’ Carol Parker was at work encouraging people to have a go at knitting and urban artist James Mayle got busy with the spray cans to create bold images around the venue. Music and dance were provided by The Ukebox Ukelele Jukebox, Hip Hop Crew and Peterborough Polish choir, Cantus Polonicum. It was an inspiring afternoon, providing local residents with bursts of creativity not often seen in the town. Indeed, the town itself, which has suffered in the recession, was given a boost as artworks from local artists, such as Fiona Gurney’s mosaics, could be seen in shop windows in the days leading up to the event. I’m hopeful this one sunny day in Holbeach will not just be a one-off experience for residents and that Transported will continue to stimulate the community in the following months and years. But I’m also pondering the fact that the Spalding Flower Parade will no longer be held due to lack of funding. Surely there is something to be learned here and, with some creative thinking, a well-loved historical spectacle can be retained alongside the development of new artistic ventures? Next Article Who is this woman imitating Julie Walters? Sounds an amazing day out. Love the inflatable tube art. I agree that it must have had a bitter sweet feel to it. So much money lavished on this new event while the traditional much-loved flower parade languishes for lack of funds. Hopefully new sources of funding will materialise for next year and the area can enjoy both the traditional and the new. I'm hoping this will happen, Sarah. Our local MP is very keen to save the flower parade although I think it will have to change in some way. But it was great to see so many at the Holbeach event – people were genuinely interested. Working in an art gallery I can only heartily approve of this event! It was very unusual and went down very well with residents: certainly the ones I saw seemed very intrigued by it all. Of course, as usual, I was a little too busy taking photos to really make the most of the experience. I wish I'd gone through again without my camera. 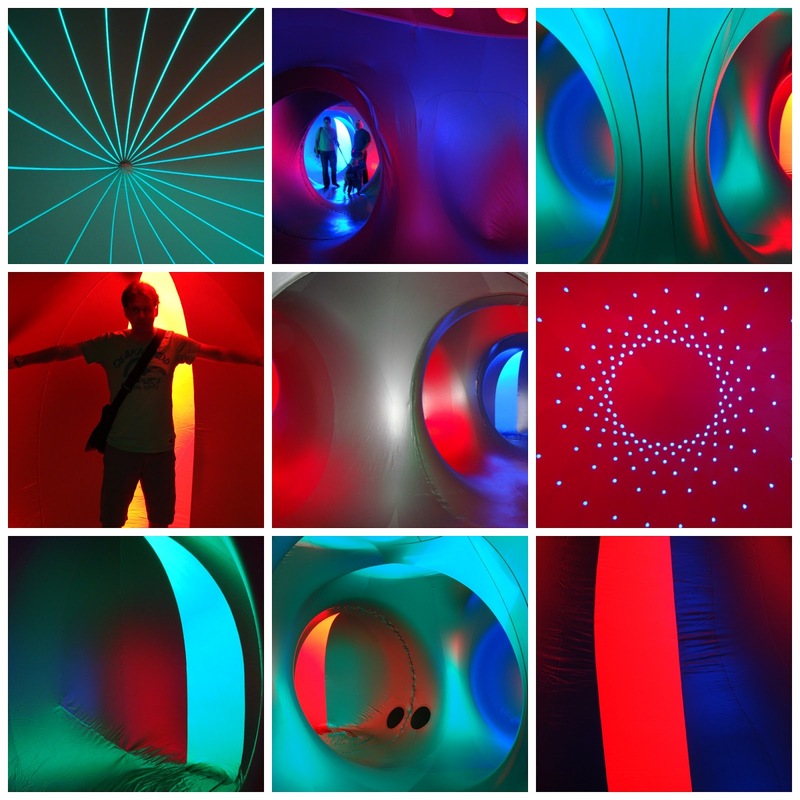 This looks great–we love interactive art installations like the Miracoco Luminarium. I felt like a child on a bouncy castle….even though I wasn't bouncing! good to see people of all ages with smiles on their faces. I love that floaty thing too. Real cool to inspire kids and the whole town…must drum up a lot of business for the rest of the town (as would the flower event) you think they would have both! As is often the case with these things: different organisations and different budgets. I'm hopeful the flower parade will continue in some fashion. Looking forward to the arty things over the next few years though, should be interesting. Sounds fab and at least you had the weather to be able to enjoy it (she says writing this at 4.30am having been woken by the wind) 🙁 And it would be great to see both events able to survive together – it seems such a shame to lose a piece of tradition like the Flower Parade. It was a gorgeous sunny day: made it even better. What wonderful pictures Trish… Sounds brilliant! Even I couldn't mess up these photos – the colours were a gift!